Kicking off this year's Horror Series, Cine welcomes back the Austin-based band, The Invincible Czars, to perform their live score accompaniment to two classic silent horror films, PHANTOM OF THE OPERA (1925) and NOSFERATU (1922). Set in nineteenth century Paris, the film tells the story of aspiring young opera singer Christine Daaé (Mary Philbin), who discovers that she has a mysterious admirer intent on helping her become a lead performer. This enigmatic masked presence is Erik, also known as the Phantom (Lon Chaney), a horribly disfigured recluse who lives underneath the Paris Opera House. When the Phantom takes Christine prisoner and demands her devotion and affection, her suitor, Vicomte Raoul de Chagny (Norman Kerry), sets out to rescue her. The Invincible Czars’ score is mysterious and understated, Using a mix of acoustic and electric instruments –- violin, piano, bass guitar, and flute -- as well as Josh Robins’ 7-string electric guitar, and more sound effects than ever before used in a Czars silent film score. TICKETS: Individual screening and performance tickets are sold separately at $12 each. 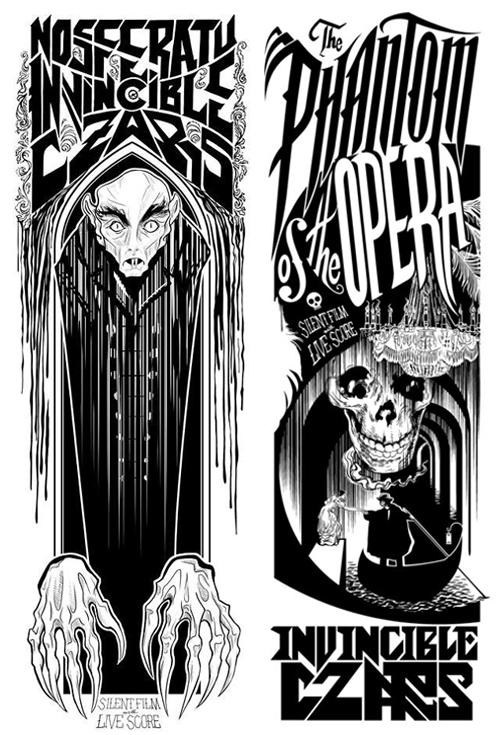 Double-feature tickets for both PHANTOM and NOSFERATU can be purchased at a discounted price of $10 each. For the double-feature, please make sure to purchase a ticket for each show to ensure seating for both!